How Does the Quick Swing Batting Trainer Work? The SKLZ Quick Swing Baseball Training Aid by Joe Mauer uses a unique delayed automated gravity-drop design to help baseball and softball batters develop greater bat speed, hitting hand-eye coordination, reflexes, and batting muscle memory. The Joe Mauer Quick Swing by SKLZ makes a great hitting station for improving hitting mechanics and creating the perfect swing. This innovative baseball batting trainer is well known for increasing bat speed. For just $89.95 you can add the Quick Swing Machine to your regular training routine. 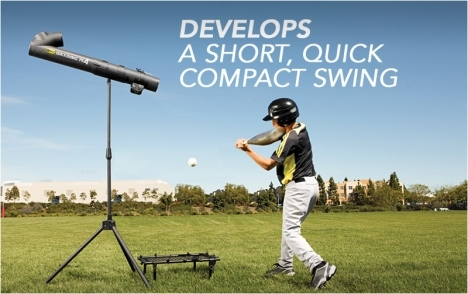 The Quick Swing Trainer is easy to use, light-weight and portable, and it developes incredible bat speed and confidence! How do you develop a short, quick, compact swing? There's no better way than with the Mauer's QuickSwing - Joe Mauer Signature Series. 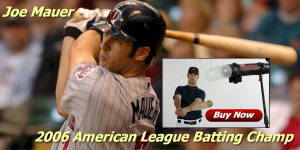 Invented by Jake Mauer II for his son, 2006 Batting Champion, Joe Mauer of the Minnesota Twins. 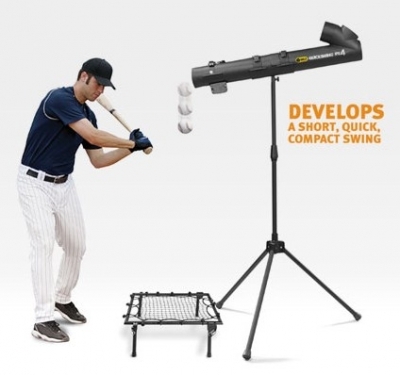 The Mauer's QuickSwing uses a unique delayed gravity-drop design to help batters develop greater bat speed, hand-eye coordination, reflexes, and muscle memory. The QuickSwing helped develop 2006 A.L. Hitting Champ Joe Mauer into one of the best hitters in baseball. It all started with a coffee can, cement and PVC pipe and now has grown into one of the hottest training aids on the market. The Quick Swing is adjustable to different heights, can be folded for easy storage and transport, and includes an instructional DVD with Paul Molitor and Joe Mauer with a proven 12 step hitting process guaranteed to help improve your batting average. Ideal for hitters of all ages and abilities. Works for baseball or softball players! New Auto-feed design allows you to load up to 12 baseballs (or 8 softalls) and cycles them out in 5 second intervals. Delivers a moving ball downward, forcing you to wait to see the ball and react quickly. Adjusts to varying degrees of difficulty. FREE instructional DVD by 2006 A.L. Batting Champion, Joe Mauer, and Hall of Fame inductee, Paul Molitor. The Mauer Quick Swing Batting Trainer is the latest and perhaps best hitting training aid to come on the market in a long while. If you're looking to improve your hitting mechanics then this hitting trainer is for you. The Quick Swing batting trainer has been endorsed by all-time MLB baseball great and future Hall of Famer Paul Molitor and by Joe Mauer, the number one pick in MLB'S 2001 draft. "The secret of the Quick Swing is that its simple concept allows a player to take batting practice by himself/herself and still be hitting a moving ball," said Jake Mauer, II, inventor and developer of the Quick Swing. "The Quick Swing enables a player to improve on the fundamentals of sound hitting - bat speed, hand-eye coordination, and proper weight distribution - while training indoors or outdoors." An adjustable dial allows you to increase or decrease the level of difficulty and develop a quicker, more compact swing as you improve your baseball or softball hitting technique. 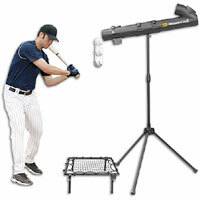 The Mauer Quick Swing batting trainer will help you improve reflexes, muscle memory and timing. 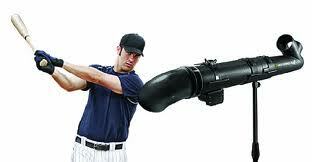 The SKLZ Joe Mauer Quick Swing replaces both your batting tee and soft toss hitting practice. 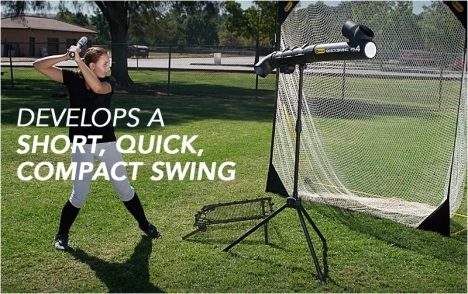 Quick Swing allows you to use real baseballs, softballs or plastic balls. Made of industrial-grade steel tubing and injected-molded plastic, the Quickswing can be positioned to drop the ball within any part of the strike zone for hitting practice in multiple pitch locations.